“When our website and overall web presence needed improving, we asked around and Complete marketing Solutions was recommended highly to us. They gave us a straightforward appraisal of our site, blog and social media performance and outlined a manageable way forward. We agreed an initial three month program that included improving the overall look and feel of the website, changing our blog platform, creating a twitter account and fine tuning our LinkedIn pages. Simon and Sophie worked alongside our regular designer Francis Porter because it was important to us to have consistency of the way we present ourselves. Their work has resulted in a vastly improved and revitalised website and blog, consistent branding and a new confidence about using Social Media. 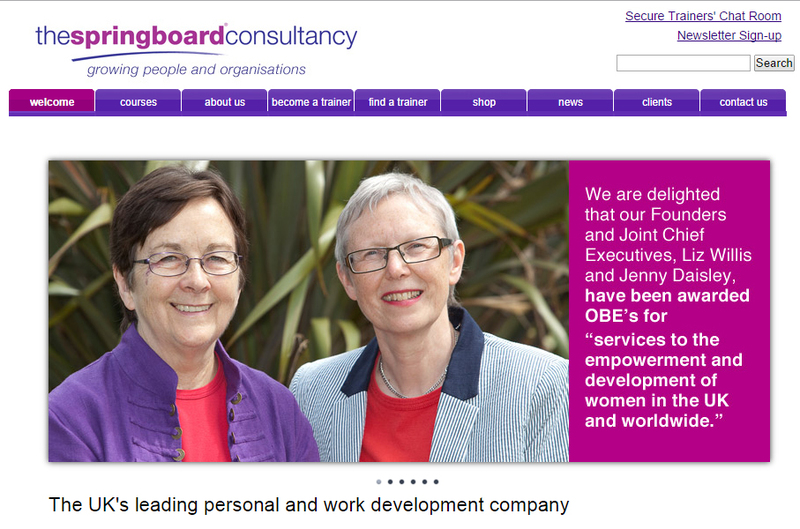 The Story – Helping The Springboard Consultancy to leap into the 21st Century! As with many of our clients, The Springboard Consultancy already had a website, however it wasn’t generating the right amounts or type of traffic to make it work efficiently to bring in new clients. To help, we re-structured the pages and navigation of Springboard website to aid user interaction and added assets such as tabs and buttons to make it easy to use. We also created new, quality copy using key words and locations to help the onsite optimisation. Having very little experience of social media, it was a big step for Liz at Springboard to allow us to create a new Business Twitter account to incorporate into their marketing strategy. We continue to work with Springboard to offer ongoing training for effective Twitter use, and guess what? They’re hooked! We knew they’d catch the Twitter bug once they’d got the hang of it with our training! Rebranding for Springboard consultancy was achieved by working alongside Francis Porter Designs to create a fresh new visual identity for the company website.